Self-driving Fords that have no steering wheels, brake or gas pedals will be in mass production within five years, the company said Tuesday. These cars will be very different from the current models of self-driving cars that Ford and other companies are now testing. Those vehicles still have space for drivers, who are expected to take control of the cars in case problems arise. Ford says its goal is to have true self-driving cars in which everyone inside is a true passenger. Other major automakers including General Motors (GM), Volkswagen (VLKAY), BMW and Nissan have set targets to have some form of self-driving cars available within five years, said Karl Brauer, analyst with Kelley Blue Book. But Ford's goal is far more aggressive since it's targeting a car that people will have no role in driving. "The other companies don't specify amount of self-driving they're promising. That's what's impressive here," said Brauer. Ford (F) said it anticipates the self-driving cars will initially be used for ride-sharing or ride-hailing services. And it said that the push to develop self-driving cars is the most important issue not just for the company but for the country as a whole. "The next decade will be defined by automation of the automobile, and we see autonomous vehicles as having as significant an impact on society as Ford's moving assembly line did 100 years ago," said CEO Mark Fields. "We're dedicated to putting on the road an autonomous vehicle that can improve safety and solve social and environmental challenges for millions of people -- not just those who can afford luxury vehicles." Self-driving cars have received some negative publicity recently, after several car accidents involving Tesla models that were in "autopilot" mode, including one fatality. Tesla's autopilot feature allows the car to handle standard braking, accelerating and steering while on highways, but Tesla still recommends that drivers stay alert and prepared to take control of the car. But many advocates of self-driving cars, including those at Google (GOOGL), argue that a true self-driving car that doesn't even give a human passenger the option to drive will ultimately be safer, since computers can be better drivers than humans. There were more than 35,000 traffic fatalities in the United States last year, and 94% of those accidents were caused by human error, according to federal safety regulators. 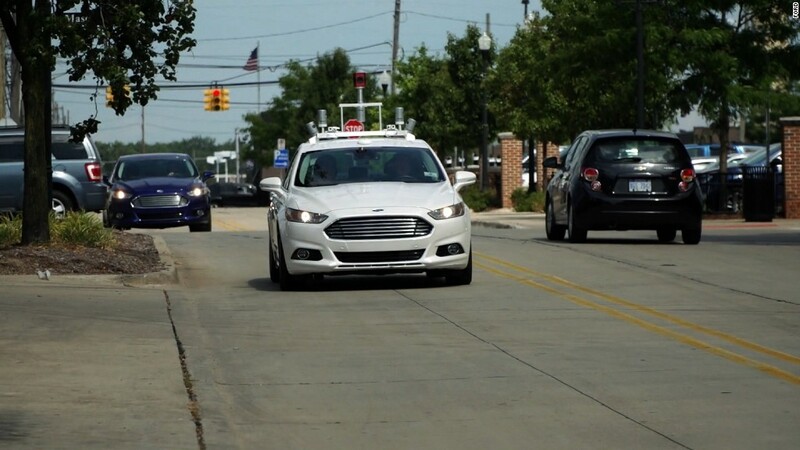 Ford (F) has about 10 self-driving Fusion Hybrid sedans that it is testing on roads in California, Arizona and Michigan, and by the end of 2018 it expects to have a fleet of about 90. Earlier Tuesday Ford and Chinese search engine Baidu (BIDU) to announced an investment of $150 million between them in a maker of laser sensors used by self-driving cars. Ford also announced it will double the staff of its self-driving car research center in Palo Alto, Calif.